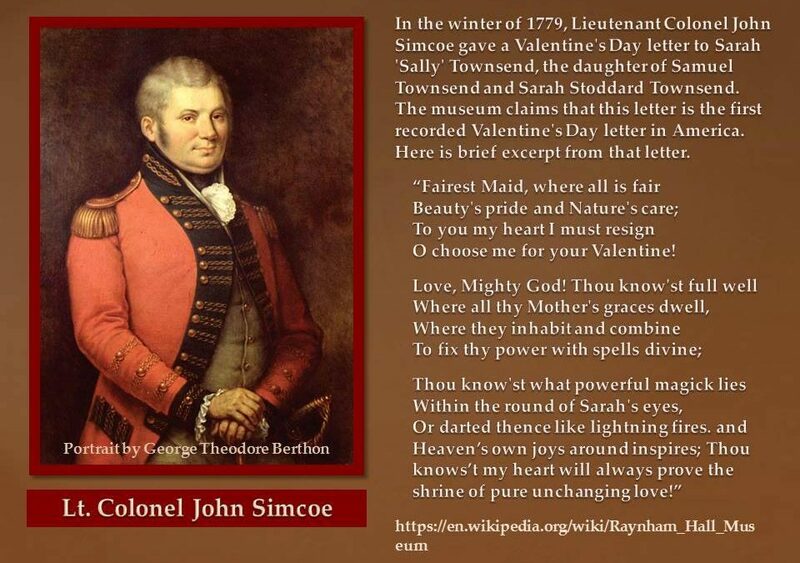 On February 14, 1779, the first recorded Valentine’s Day letter in America was given by, then, British Lieutenant Colonel John Simcoe to Sarah “Sally” Townsend. To understand the significance of this expression of love, we have to know a little more about the people involved. John Graves Simcoe was born in Cotterstock, Oundle, England on February 25, 1752. During the American Revolution, Simcoe led a light infantry unit, the British army’s Queens New York Rangers (later the Queen’s York Rangers) in a series of daring raids, as well as acting as a support for the regular British forces during the British occupation of New York. Sarah “Sally” Townsend, was born in 1760 in Oyster Bay, NY and was the daughter of Samuel Townsend, a liberal Quaker, and Sarah Stoddard. She was one of eight children. What is interesting to note is that it was Sally who is reputed to have overheard conversations between Lt. Col. John Graves Simcoe and Major John Andre. She then passed the information on the patriot Culper Spy Ring via her brother Robert Townsend, “Culper Junior”. This information, in part, eventually led to the capture and hanging of Andre. At the end of the war, John Simcoe went back to England as an invalid. He entered politics and was made lieutenant-governor of the new loyalist province of Upper Canada. Simcoe died in Exeter, England on October 26, 1806 at the age of 54. He is buried in Wolford Chapel on the Simcoe family estate near Honiton, Devon. Sarah Townsend remained unmarried and died in 1842. She is buried in the Townsend Cemetery. Did Sally share Simcoe’s infatuation? We have no way to know but someone carved initials in the glass of her bedroom window; her initials and those of Simcoe. It’s believed to have been her handiwork. John Simcoe’s Valentine poem and the block of glass with the carvings can be seen today at the Townsend house, Raynham Hall and museum, in Oyster Bay, NY.